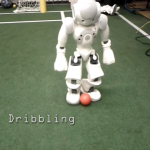 (English) Besides our current work on dynamic bipedal motions (walking, dribbling) and new approaches to situation modeling this video features some interesting game scenes from the RoboCup 2013 demonstrating the soccer performance of our robots. 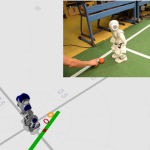 (English) In this video we briefly present the current state of our research on Nao related to RoboCup SPL. In particular we demonstrate omnidirectional walk, dynamic changing of the feet relation and step trajectory during the walk, player tracking, adaptive color detection, using of visual features for detection of the field side and self localization with same-colored goals. 4th place in the simulation! We made it! All the details later. We can already tell that it was f***ing close! STOP! The opponent is challenging the result, so they are asking us to repeat the second half. We are really in a conflict. What shall we do? In the last days we all were focussed on the standard platform league. We had a lot of things to fix and so the simulation league just went fine without too much incidents. We reached the semifinals so far. So stay tuned! 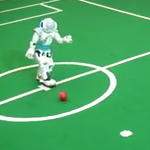 So in a few minutes the B-Human team is going to find out what it takes to beat us :D 16:30 is kick-off. Lets hope we survive the first half! All the results can be found at the tzi.de page. 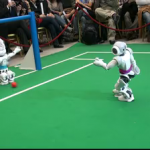 NaoTH is qualified for RoboCup 2011 in the SPL!!! 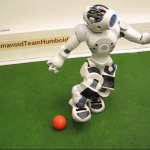 In this video we briefly present the current state of our research on Nao related to RoboCup SPL. 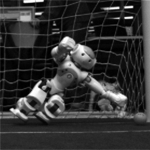 In particular we demonstrate omnidirectional walk, dynamic kick motion, player recognition based on SURF, percept correction and self localization.